Literature search results (Quality of Reports of Meta-analyses [QUOROM] flowchart). ARDS indicates adult respiratory distress syndrome. Effect of perioperative supplemental oxygen therapy on surgical site infection risk reduction. Risk ratios (RRs) with 95% confidence intervals (CIs) are shown for individual, combined, and sensitivity analysis (SA) values. 1 indicates Mayzler et al10 (RR, 0.667; 95% CI, 0.125-3.550; P = .64); 2, Pryor et al11 (2.222; 1.078-4.580; P = .03); 3, Belda et al12 (0.607; 0.375-0.983; P = .04); 4, Greif et al13 (0.464; 0.246-0.875; P = .02); 5, Myles et al14 (0.740; 0.559-0.979; P = .04); overall (0.742; 0.599-0.919; P = .006; I2 = 65.584); SA1, noncolorectal studies excluded (0.556; 0.383-0.808; P = .002; I2 = 0.000); SA2, nitrous oxide studies excluded (0.551; 0.375-0.808; P = .002; I2 = 0.000); SA3, the study by Pryor et al excluded (0.667; 0.533-0.835; P = .000; I2 = 0.000); and SA4, the largest study excluded (0.744; 0.534-1.037; P = .08; I2 = 74.186). Squares represent individual randomized controlled trials; lines attached to squares, individual 95% confidence intervals; diamonds, the combined effect of several (or all) meta-analyses. Funnel plot to visually detect publication bias. Circles correspond to individual studies; diamond, logarithm of the overall risk ratio; and 0, no effect and equivalent to a risk ratio of 1. Objective To conduct a meta-analysis of randomized controlled trials in which high inspired oxygen concentrations were compared with standard concentrations to assess the effect on the development of surgical site infections (SSIs). Data Sources A systematic literature search was conducted using the MEDLINE, EMBASE, and Cochrane databases and included a manual search of references of original articles, poster presentations, and abstracts from major meetings (“gray” literature). Study Selection Twenty-one of 2167 articles met the inclusion criteria. Of these, 5 randomized controlled trials (3001 patients) assessed the effect of perioperative supplemental oxygen use on the SSI rate. Studies used a treatment-inspired oxygen concentration of 80%. Maximum follow-up was 30 days. Data Extraction Data were abstracted by 3 independent reviewers using a standardized data collection form. Relative risks were reported using a fixed-effects model. Results were subjected to publication bias testing and sensitivity analyses. Data Synthesis Infection rates were 12.0% in the control group and 9.0% in the hyperoxic group, with relative risk reduction of 25.3% (95% confidence interval [CI], 8.1%-40.1%) and absolute risk reduction of 3.0% (1.1%-5.3%). The overall risk ratio was 0.742 (95% CI, 0.599-0.919; P = .006). The benefit from increasing oxygen concentration was greater in colorectal-specific procedures, with a risk ratio of 0.556 (95% CI, 0.383-0.808; P = .002). Conclusions Perioperative supplemental oxygen therapy exerts a significant beneficial effect in the prevention of SSIs. We recommend its use along with maintenance of normothermia, meticulous glycemic control, and preservation of intravascular volume perioperatively in the prevention of SSIs. Oxidative killing of pathogens by polymorphonuclear leukocytes is the primary mechanism of defense against surgical pathogens.8 Oxygen partial pressures and wound tissue oxygen tensions have been shown to correlate with oxidative killing and have been reported to predict SSI rates.9 As a result, several randomized controlled trials (RCTs)10-14 have been conducted to assess the benefit of perioperative supplemental oxygen therapy. Although results that support the use of supplemental oxygen have shown it to decrease SSIs in some studies, results have been inconsistent overall. The trials included varying population subsets with varying criteria for diagnosing SSI (clinical-only scoring systems vs clinical and microbiologic diagnosis); therefore, the role of perioperative hyperoxia has remained undetermined. We combine the results of all double-blind RCTs comparing the use of high inspired oxygen concentrations with standard concentrations to determine the efficacy of this treatment in preventing SSIs. A search was conducted, without language restrictions, of the MEDLINE (January 1, 1966, to September 30, 2007), EMBASE, and Cochrane databases using the search engines PubMed, Ovid, and Google Scholar. The following Medical Subject Heading terms were used: infection, sepsis, oxygen, hyperoxia, wound, and surgical. Boolean operators (“and,” “or,” and “not”) were used to narrow and widen the search. To increase the number of hits using the Ovid search engine, we used the “explode” and “related article” functions. Based on the title of the publication and its abstract, we either downloaded the full article or requested it through our library. We manually searched the references of original and review articles and evaluated symposia proceedings, poster presentations, and abstracts from major surgical and anesthetic meetings for a 10-year period (1998-2007) to locate unpublished material and to reduce the likelihood of publication bias.15 Finally, we reviewed the reference lists of articles obtained to complete the search. We subsequently developed inclusion and exclusion criteria and subjected filtered results to sensitivity analyses to quantitatively evaluate the heterogeneity of the findings. Abstracts, full articles, and “gray” literature (nonconventional publications) that had passed the primary screening procedure were retrieved. These publications were then screened to include the following: human clinical RCTs, studies with 2 arms using high (treatment) and normal (control) inspired oxygen concentrations perioperatively, and single-center and multicenter worldwide trials. The following works were excluded: American Society of Anesthesiology class 5/5E and moribund patient populations, purely laparoscopic (non–hand-assisted) procedures, minor outpatient (day-case) surgery studies, pediatric and neonatal studies, hyperbaric ventilation studies, hypercapnia studies, obesity studies, and case-control studies, case reports, letters, comments, reviews, and abstracts with insufficient details to meet the inclusion criteria. The primary outcome analyzed was SSI diagnosed (1). clinically (NNIS wound infection index,16 Centers for Disease Control and Prevention SENIC [Study on the Efficiency of Nosocomial Infection Control] wound infection index,17 ASEPSIS [additional treatment, the presence of serous discharge, erythema, purulent exudate, and separation of the deep tissues, the isolation of bacteria, and the duration of inpatient stay] score,18 and purulent discharge alone or any combination of clinical markers, such as skin induration, erythema, or pyrexia), (2) microbiologically (positive culture of pus specimen), or (3) both clinically and microbiologically. The interval from the day of surgery in which the SSI diagnosis was captured was different in each study, ranging from 14 days to 1 month. Furthermore, the study by Pryor et al11 used a medical record review to identify SSI, thereby capturing this information retrospectively. Data were abstracted by 3 independent reviewers (M.Q., O.A., and S.S.M.) to meet predetermined inclusion and exclusion criteria. Data were abstracted using a standardized form and included first author, publication year, study type, study location, patient demographics, study quality (determined using the Jadad scale),19 type and duration of surgery, and number of cases and SSIs diagnosed. In the case of a discrepancy, a consensus decision was made. We stratified the outcome variable in response to control (30%) or treatment (80%) perioperative oxygen concentrations as infected or noninfected. Meta-analysis was performed according to the recommendations of the Cochrane collaboration. In every study, we calculated the risk ratio (RR) and 95% confidence interval (CI) for the primary outcome, SSI. Relative risk reduction (RRR), absolute risk reduction (ARR), and number needed to treat (NNT) were calculated to assess whether the overall RR was of clinical importance. The RRR represents the proportional reduction in SSIs between the hyperoxic and control participants in a trial. The ARR signifies the absolute difference in infection rates between the groups. The NNT is the reciprocal of the ARR and denotes the number of patients who would need to be treated to prevent 1 SSI. Sensitivity analysis was undertaken to evaluate the effect of excluding noncolorectal studies, studies that used nitric oxide mixtures, and studies that may have caused significant skew on the overall data. Several strategies were adopted to assess the validity of this approach. The I2 index was used to measure heterogeneity between studies. I2 values lie between 0% and 100%. Increasing I2 values represent increasing heterogeneity. By convention, I2 values greater than 50% represent heterogeneity. We also constructed funnel plots to inspect for the presence of publication bias, followed by quantitative assessment of publication bias using the Egger regression test,21-24 which detects funnel plot asymmetry by determining whether the intercept deviates significantly from zero. If the CI does not include zero, there is evidence of publication bias. Statistical significance was assigned at the P < .05 level where appropriate. Analyses were performed using Comprehensive Meta-Analysis V2.0 (Biostat Inc, Englewood, New Jersey). Five studies met the inclusion criteria,10-14 of which 3 were multicenter trials12-14 conducted across Europe and Australasia. Two were single-center trials10,11 conducted in the United States and Israel. All of the studies were double blind, although concern was raised about one study's blinding methods.11,25 All of the studies used 80%, or a mean of 80%,14 oxygen as the hyperoxic concentration. Thirty percent oxygen was used as the control concentration in all but 1 study11, which used 35%. Most studies continued oxygen supplementation for 2 hours postoperatively, although 1 study12 continued oxygen supplementation for 6 hours after surgery, and another study13 continued treatment for variable intervals, depending on local protocols in its multiple centers. A nitrous oxide mixture was incorporated in 3 studies,10,11,14 either in the control group alone or more frequently in controls than in treatment patients. Three studies10,12,13 included only colorectal procedures. Laparoscopic procedures were included only if an additional incision was also made. Pathologic findings included inflammatory and neoplastic disease. A total of 3001 patients were pooled from individual trials, of whom 1494 were randomly assigned to receive higher inspired oxygen concentrations perioperatively. Crude infection rates were 12.0% in the control arm and 9.0% in the hyperoxic arm. Hyperoxia resulted in an RRR of 25.3% (95% CI, 8.1%-40.1%) and ARR of 3.0% (1.1%-5.3%). The NNT was 33.0 (18.8-90.9). The overall RR was 0.742 (0.599-0.919; P = .006) (Figure 2). Sensitivity analyses were conducted to determine whether excluding studies that involved general surgical procedures, studies that used nitrous oxide, the opposing study, and the largest study had a significant effect on the overall strength and direction of the results (Figure 2). Three studies10,12,13 included only colorectal procedures. The other 2 studies included a larger variety of operations. Excluding the noncolorectal-specific studies on the basis that colorectal operations have a more uniform rate of SSI resulted in a lower RR of 0.556 (95% CI, 0.383-0.808; P = .002; I2 = 0.000). When the 3 studies10,11,14 that used nitrous oxide, either exclusively or more frequently in the control group, were excluded, an RR of 0.551 (95% CI, 0.375-0.808; P = .002) resulted. I2 = 0.000 after the exclusion. We created a funnel plot using the log of the RR and the standard error of the log of the RR as the x- and y-axes, respectively (Figure 3). Clustering of studies in a narrow band of the y-axis indicates that the studies have nearly the same precision, whereas clustering with respect to the x-axis indicates that they are similar with respect to effect size. Not all of the high-quality studies fell within the 95% CI (the inverted funnel), suggesting variability with respect to precision and effect. The studies were not distributed equally along the y-axis in the plot, suggesting potential publication bias. However, this was not supported by quantitative assessment of publication bias: the Egger regression, P = .80 (−5.34 to 6.37; 95% CI). Publication bias assessments, RRRs, ARRs, and NNTs for individual sensitivity analyses are available from the corresponding author. Surgical site infection is a common preventable outcome that has been the focus of quality improvement initiatives in recent years.26 Factors such as antibiotic drug selection and timing of administration, maintenance of perioperative normothermia and normoglycemia, meticulous detail to surgical technique, and adequate postoperative pain control have been proved to reduce the infection rate.2,27-31 The effect of supplementary perioperative oxygen continues to be debated, with proponents and opponents firmly divided over the issue.32 A recent review by Chura et al32 addressed the results of 4 of the 5 studies included in the present review but excluded the largest study, by Myles et al14 (n = 2012), because the results were not yet available. It has been argued by some researchers that despite the benefit incurred from the use of hyperoxia to reduce the SSI rate, no additional benefit on other variables, such as length of stay12,13 and time to first feed and removal of staples,33 was seen. Other researchers34 have suggested that outcome defined by SSI rate alone is clinically significant. When we combined the results of all of the RCTs performed, we observed that perioperative hyperoxia reduced the risk of SSI. The pooled RRR of 25.3%, the ARR of 3.0%, and the NNT of 33.0 were statistically significant findings, which confirmed the benefit of supplementary hyperoxia. On this basis, when colorectal studies are pooled, these findings are consistent with the prediction of Dellinger,42 which suggests a more significant benefit from the use of hyperoxia in colorectal surgery. The increased benefit maybe a result of excluding the study by Pryor et al.11 However, unless any detrimental adverse effects are confirmed in this type of procedure, we advocate the use of perioperative hyperoxia to reduce SSI in colorectal surgery. Myles et al14 studied 2012 patients and incorporated nitrous oxide in the anesthetic mixture in 1 arm of the study only (70% nitrous oxide with 30% oxygen). Control patients were treated with an average of 80% oxygen in nitrogen. There was no requirement in the study protocol to continue 80% oxygen in the postoperative period, and the definition of SSI was specifically stated as “if associated with purulent discharge, with or without a positive microbial culture; or pathogenic organisms isolated from aseptically obtained microbial culture.”14(p224) The authors14 concluded that hyperoxia or the absence of nitrous oxide significantly reduced the SSI rate. Nitrous oxide use results in irreversible inhibition on vitamin B12, which inhibits methionine synthase, folate metabolism, and DNA synthesis. This is the proposed mechanism by which immunodeficiency and impaired wound healing may result.43-45 However, in a recent multicenter RCT,46 418 patients undergoing colonic resections lasting more than 2 hours were studied; one group received 65% nitrous oxide in oxygen and the other group received the same amount of nitrogen in oxygen. Surgical site infection was the primary end point. Fifteen percent of patients developed wound infections in the nitrous oxide group compared with 20% in the nitrous oxide–free group (P = .21). Furthermore, no difference was encountered in time to first feed, ASEPSIS healing score, and mortality. The authors concluded that there were no deleterious effects associated with use of the gas. Similarly, Pryor et al11 used nitrous oxide in a greater proportion of controls but did not demonstrate an increased SSI rate. In fact, infection rates were higher in the hyperoxic group, which received significantly less nitrous oxide. These findings suggest that the reduction in SSIs seen in the hyperoxic group in the study by Myles et al14 may have largely been due to hyperoxia alone. Mayzler et al10 did not demonstrate a significant beneficial effect from using a high oxygen concentration with no nitrous oxide in their treatment arm, the relevance of which is limited because the sample size was very small, resulting in an underpowered study. A sensitivity analysis excluding studies that used nitrous oxide still demonstrated benefit from the use of hyperoxia on the SSI rate in the remaining trials. Therefore, even if nitrous oxide use was a risk factor for SSI, there was, nevertheless, a significant benefit that may be attributed to hyperoxia alone. This finding may, once again, be largely due to exclusion of the “negative” results of Pryor et al,11 although this study did not demonstrate an increase in SSIs due to nitrous oxide use. When the studies that did not use nitrous oxide were excluded, a marginal but nonsignificant benefit was seen on the SSI rate (RR, 0.849; 95% CI, 0.656-1.099; P = .21) (data available on request). This result means that the inclusion of nitrous oxide gas in this analysis did not demonstrate added benefit with hyperoxia because of the deleterious effects of nitrous oxide gas in the control arm. This further supports the previous statement that the reduction in the SSI rate may mostly be due to hyperoxia alone. Isolation of the benefit of hyperoxia from the potential deleterious effect of nitrous oxide is largely futile because high oxygen concentrations naturally exclude nitrous oxide mixtures. 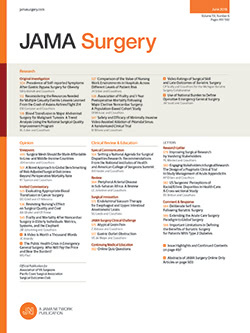 The trial by Pryor et al11 has been the subject of intense scrutiny, with critics noting that the authors intentionally included a variety of procedures and did not standardize study groups.42 Differences in intraoperative blood loss and postoperative fluid replacement varied significantly between the groups despite intravascular volume depletion having been implicated as an etiologic risk factor for wound infection.47,48 Furthermore, body mass index was significantly higher in hyperoxic individuals. A recent review49 of obesity showed a negative effect on SSI outcome in colorectal procedures. In addition, obesity significantly reduces wound oxygen tensions,50 thus undermining the primary defense mechanism of polymorphonuclear leukocyte oxidative killing. The trial by Pryor et al11 was truncated after the evaluation of 160 patients due to the increase in SSIs seen in the hyperoxic group and was described as an a priori stopping point. Whether a priori termination was the correct thing to do will continue to be debated. Caution must be advised when interpreting truncated RCTs because results may inaccurately overestimate the effect that resulted in cessation of the study and render the study underpowered.51 Belda et al12 subsequently provided power calculations for sample size and determined that Pryor et al11 would have required more than 500 patients to detect the smallest clinically significant increase in SSIs.27 Because 35% oxygen was used in controls, we justified a sensitivity analysis that excluded the study by Pryor et al. This analysis showed a significant benefit from the use of hyperoxia to reduce the SSI rate in the remaining homogenous trials. When excluding the largest study from the analysis, a marginal, although statistically insignificant, benefit persisted from the use of hyperoxia on the SSI rate. The large population enrolled by Myles et al14 may have exerted some skew on the overall data, which concerns us because more patients were included by Myles et al than by all the other studies combined. This fact questions whether the largest study overwhelms the smaller ones, especially given the homogeneity that the large study sample may impose on the collection of smaller heterogeneous studies. A small proportion of patients enrolled by Myles et al in the “hyperoxic” group (n = 156) did not receive more than 51% oxygen. However, mean inspired oxygen in the group was 80%, and, therefore, results could be pooled with 80% hyperoxic treatment groups from other studies. There are usually limitations in meta-analysis due to inherent differences between combined studies. Differences herein include variability in antibiotic drug prophylaxis, length of follow-up for SSI (14-30 days), continuation of postoperative oxygen supplementation, and risk stratification of patients based on recognized scoring systems, a factor that was not included in most studies (eg, the NNIS risk index, which assigns 1 point for each of the following: contaminated wound, American Society of Anesthesiologists class 3 or higher, and a surgical procedure that lasted longer than the NNIS-proposed duration limit for that procedure). The effects of timely antibiotic drug therapy,52 avoidance of shaving,53 and maintenance of normothermia2 and normoglycemia28 are evidence-based practices that are known to lower the infection rate. Careful adherence to such guidelines was not evident in all studies. Finally, the observed baseline SSI rate is noted to be high in the included trials (which may be due to the inclusion of clean-contaminated procedures). Lower baseline rates would have otherwise masked the positive results seen and resulted in higher NNTs for institutions or procedures with lower SSI rates. In conclusion, although most studies have shown a favorable outcome from the use of supplementary hyperoxia, no agreed-on guidelines exist regarding its use to prevent SSIs. In this meta-analysis, using strict inclusion and exclusion criteria developed by an established researcher in the field (O.A.) and a biostatistician (C.A.H. ), we showed that oxygen exerts a statistically significant beneficial effect on the prevention of SSIs, which is likely to be independent of the deleterious effects of nitrous oxide in standard oxygen concentration preparations. In addition to the maintenance of normothermia, meticulous glycemic control, and preservation of intravascular volume, we recommend the use of hyperoxia to reduce wound infections, especially during colorectal surgery. Correspondence: Motaz Qadan, MBChB, MRCS(Ed), Price Institute of Surgical Research, Medical-Dental Research Bldg (3rd Fl), 511 S Floyd St, Louisville, KY 40202 (m0qada01@louisville.edu). Accepted for Publication: February 26, 2008. Author Contributions:Study concept and design: Qadan, Akça, Mahid, and Polk. Acquisition of data: Qadan, Akça, and Mahid. Analysis and interpretation of data: Qadan, Akça, Hornung, and Polk. Drafting of the manuscript: Qadan and Mahid. Critical revision of the manuscript for important intellectual content: Qadan, Akça, Hornung, and Polk. Statistical analysis: Qadan, Mahid, and Hornung. Study supervision: Akça and Polk. Funding/Support: This work was funded in part by the Joint Royal College of Surgeons of Edinburgh/James and Emmeline Ferguson Research Fellowship Trust (Dr Qadan) and the John W. and Caroline Price Family Trust (Dr Mahid). Role of the Sponsors: The funding sources had no role in the production of the manuscript. Additional Contributions: We thank Susan Galandiuk, MD, for her guidance in producing the manuscript.